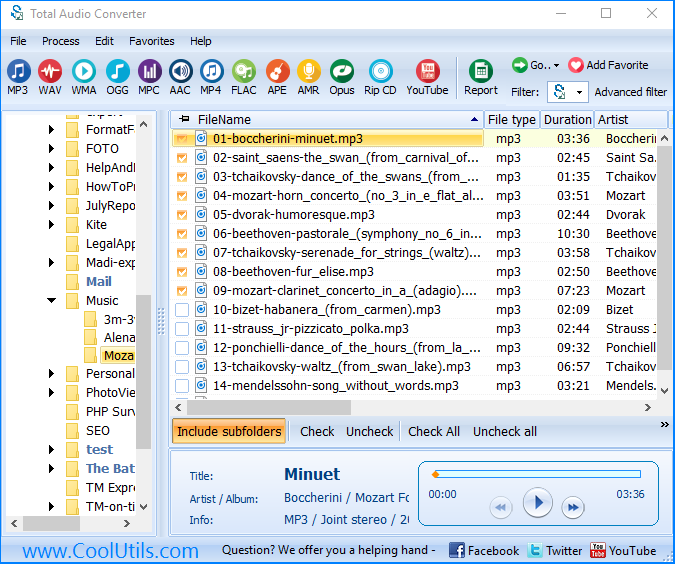 Total Audio Converter is the best tool to convert mp3, wav, flac, ogg, ape and much more. Look closer at it: TAC supports all audio formats, has built-in CD ripper and audio player, can be handled via command line and is still very user-friendly. Total Audio Converter was developed to fulfill all your audio conversion needs. First, it supports WAV, MP3, OPUS, APE, FLAC, WMA, MP4, AAC, MPC and 20 more audio formats. Whatever format you will need to convert, TAC’ll do that. Second, it rips CDs, gets music from YouTube, uploads tracks to iTunes. The price ($24.90 life license) for an all-in-one audio converter with built-in CR ripper, audio player &amp; command line support is quite fair, isn’t it? Seems good for MP4 files. I tried just one folder with 35 tracks and it worked all right. Will keep for future needs. I’m a little disappointed in this software. It appears to be easy to use – maybe too easy, as it leaves out at least one key feature that other CD or media converters have. The one in particular feature missing is the inability to change or even designate the album name and or track on the fly when ripping a CD. This is a must have for folks who rip audiobook CDs. 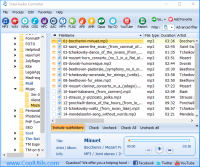 The album, disk number and track info are often missing from the disk’s metadata – and the integration with the FreeDB internet database, though a good feature for music CDs doesn’t really work for audiobooks. I took a quick look at the actual conversion features between one format and another – and it really has been setup as an easy process. Newbies should like it. To be totally honest though – if this wasn’t free through Sharewareonsale, I would be looking for a freeware app to do my ripping.